Boxing is one of the oldest and most prestigious sports there is. No sport better exemplifies the idea of “only the strong survive” more-so than boxing. In order to be a successful boxer, you must be in impeccable shape both physically and mentally. This requires a great deal of training. Of course, to train and compete adequately, you’re going to need a great pair of boxing gloves. These come in many different shapes, sizes, and types, with each existing to serve its purpose. But what makes a great pair of gloves? This guide will set you on the right path. Winning is a company that produces some of the highest quality boxing gloves on the market today. Their products are used professionally by boxers such as Roman Gonzales and Takashi Uchiyama. But, not only do they make excellent fighting equipment; they also make excellent training equipment. Their top training glove is the Winning Training Boxing Gloves. They provide top-notch hand protection, keeping your hands fresh and strong so that you can train for as long as you want. At 16 ounces in size, they are perfect for sparring, and are also suitable for heavy bag work and other forms of training. They require no break in time, arriving with a soft cushion and comfortable flexibility that will have you ready to go full force on your first day. Made with an anti-thumbing technology, they will keep your thumb isolated from the the wrest of your fist. This will prevent you from leading with the tip of your thumb when punching, ultimately reducing the risk of injury. They offer especially good protection to the knuckles, lending them a great deal of cushion while keeping them from rolling around loosely inside. Made of high quality leather, and constructed with great attention and care, they are very durable and capable of withstanding a great deal of wear and tear. Coming in both Velcro and lace up versions, you can use them for solo training as well as for training with others. The Velcro version is much easier to put on if you’re training by yourself, but does not provide you with quite the same snugness as the lace up version. The lace up version is more snug and offers more support, but requires other people to help you lace them up. Online reviewers love them for how well they absorb shock, with one reviewer stating that his chronic wrist discomfort has gone away since he started training with them. Reviewers also give them credit for how well they protect their hands, noting how soft they are, and stating that they allow them to train for as long as they want. Some online reviewers say that the gloves don’t fit their hands well, stating that, if you have large hands, you should probably consider something else. This is because long fingers will poke at the end of the finger sockets, ultimately restricting your hand movement. Of course, it would be wise to try them on to determine whether or not they fit you adequately. All in all, the Winning Training Boxing Gloves are the premier training gloves in boxing. Whether you’re interested in sparring, mitt work, or bag work, they are an excellent pair that will serve you well. If you’re looking for the best training equipment on the market, look no further than the Winning Training Boxing Gloves. When it comes to the sport of boxing, Cleto Reyes is one of the biggest names on the market today. Their products are worn professionally by prestigious boxers such as Manny Pacquiao and Timothy Bradley. 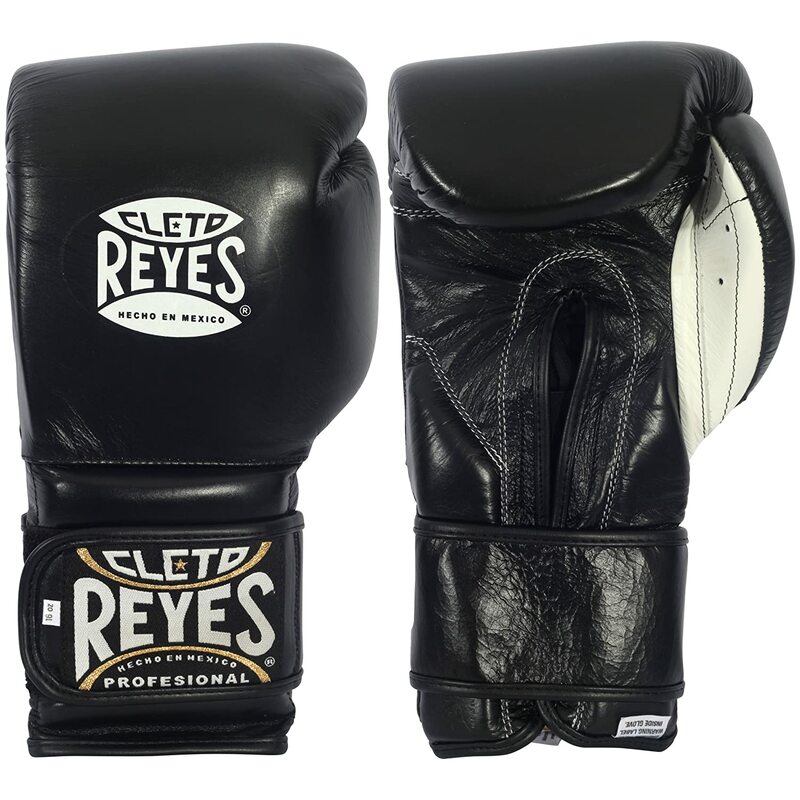 Known for their craftsmanship and attention to quality, Cleto Reyes’ top training gloves at the moment are the Cleto Reyes Hook & Loop Training Gloves. They come in four different sizes, including 12 ounces, 14 ounces, 16 ounces, and 18 ounces. While they are most appropriate for training, you could theoretically use the size 12s for competitive fighting. They have a great deal of cushion in the knuckle section, providing excellent finger protection and allowing you to train for extended periods of time without pain. Though they take a bit of time to break in, once they do, they will fit perfectly to your hand, providing you with excellent flexibility and comfort. With a wide, firm wrist strap, the Hook & Loops provide you with stellar wrist support. The strap is adorned with Velcro, allowing you to wrap it as tight as you wish. If you desire a very snug fit they will accommodate you. If you prefer a little air between your wrist and the glove, they will suit you as well. Because they make use of Velcro, they can be put on easily without the assistance of others. This makes them good for solo training as well as partner training. Made of beautiful, 100% leather, they are extremely durable, able to withstand a great deal of wear and tear without losing any of their function or performance. One of the nice things about them is that they come in a bevy of colors and styles. From plain black, to plain white, and every color in between, there is a color that will fit you. Online reviewers give them credit for how durable they are, noting their 100% leather construction and ability to withstand the heavy bag for longs periods of time. Reviewers also laud them as being excellent for strong punchers. They are firm on the outside, but still provide a very snug and comfortable fit that will leave your hands feeling fresh. Some reviewers criticize them for how their lack of padding, stating that they don’t provide much cushion for their knuckles, making them ill equipped for hitting heavy bags. A few reviewers have also noted that they take a while to break in. This is the opposite of the Winning training gloves, which are broken in from the beginning of their existence. On the whole, Cleto Reyes Hook & Loop Training Gloves are a great pair for those who wish to punch, and punch hard. Extremely durable, they can withstand hours on the heavy bag without showing any signs of wear and tear. If you’re looking for a snug, but firm pair of training gloves that rival any other on the market, you should definitely consider the Cleto Reyes Hook & Loops. 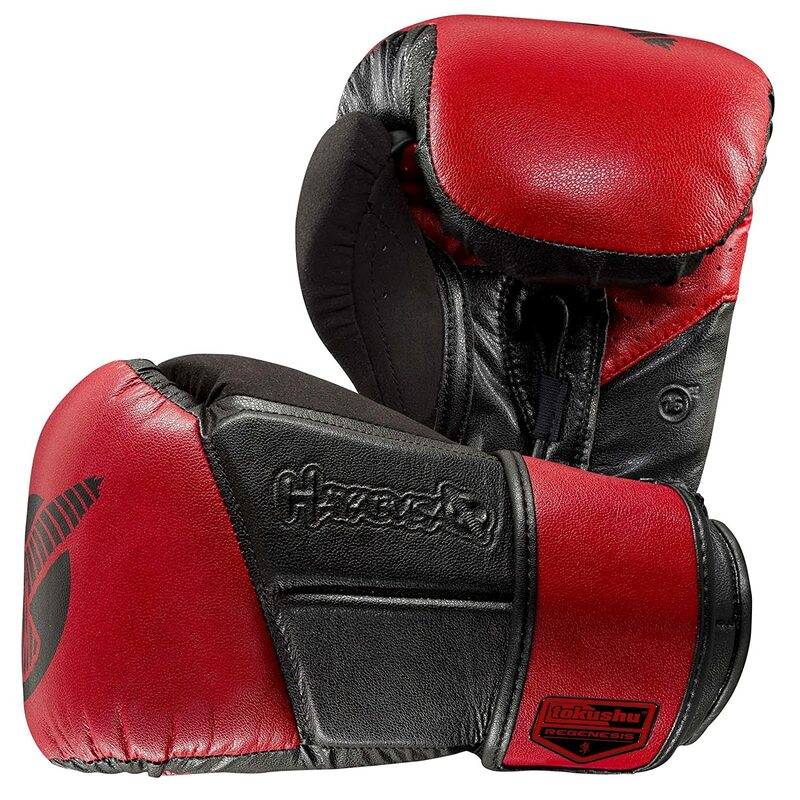 Hayabusa manufactures high quality boxing gloves in a variety of styles and colors. Whether you’re a competitive fighter,or just like to train, the company has a stylish and effective product for everyone. At the current time, their top piece of training equipment is the Hayabusa Fightwear Tokushu Regenesis. These gloves combine exceptional construction with innovative technology to create a product that is both highly functional and ridiculously comfortable. Like all good sparring gloves, these Regenesis’ measure in at 16 ounces in size. Of course, they can also be used for purposes other than sparring. They would be great for hitting the heavy bag with, and would also be very suitable for hitting mitts. Their Deltra-EG Inner Core combines with their technologically advanced Crush Zone to absorb any unwanted energy, helping to keep your hands protected at all times. Despite their very light weight, they supply a great deal of cushion that will protect your knuckles as well as your sparring partner. Available in a bevy of colors, including black, white, red, gray, orange, yellow, blue, and purple, they make use of a Velcro wrist enclosure. This makes them great for people who like to train solo, as they can easily put them on by themselves without any help. After they’ve been put on, they provide you with stellar hand and wrist alignment. Your hand will fit snugly in of them which will result in excellent punching technique that builds healthy training habits. Made of leather, they are very durable, and do a great job of staving off deterioration. A nice feature in Regenesis’ is their Sweat-X thumb. The thumb is made of a suede material that wicks away sweat and allows for maximum comfort regardless of how long you’ve been training. These gloves also possesses fantastic ventilation, allowing heat and odor to escape them, and keeping them fresh for a longer period of time. Online reviewers laud them for their excellent wrist support, stating that they lock your wrist in snugly and keep them supported as well as any other glove on the market. Reviewers also give them credit for how comfortable they are, with one reviewer noting that they feel more comfortable than a memory foam pillow. Some reviewers criticize them for how stiff they are, saying that they forced their hands into awkward positions and caused soreness every time that they trained. Other reviewers note that they are very difficult to put on and take off. The wrist support sticks to their hand and causes a great deal of friction. Overall, the Hayabusa Fightwear Tokushu Regenesis are a very nice pair of training gloves. Innovative and highly cushioned, they provide you with excellent hand protection while allowing you to be as comfortable as possible during your workout. If you’re looking for a pair that will provide you with unmatched hand protection and wrist support, the Hayabusa Fightwear Tokushu Regenesis are something you should definitely take a look at. Boxing gloves aren’t exactly cheap. This is especially true if you’re looking for very high quality ones. And, the fact of the matter is that you might not have the money necessary to drop on an expensive pair. Fortunately, there are many pairs out there that are just as good as many of the high priced selections. The Everlast Pro Style Training Gloves fit this bill perfectly. They are available in five sizes, including 8 ounces, 10 ounces, 12 ounces, 14 ounces, and 16 ounces. The 12, 14, and 16 ounce sizes are most appropriate for training, and would be great for using on heavy bags and for sparring. The 8 and 10 ounce sizes are most appropriate for competitive fights. They don’t provide as much padding for either the user or the person getting hit by them, but overall, they possess a great deal of cushion. Making use of a two-layer foam, they absorb shock exceedingly well, keeping your hands safe from injury, and preventing fatigue in general. Made of synthetic leather, they are not quite of the same quality as the other gloves on this list, but are still very durable, withstanding wear and tear for a long period of time. They are constructed in a way that is meant to keep your hand and wrist completely aligned, promoting flawless punching technique that will keep you safe and efficient. Assisting in this area are their ThumbLok feature, which keeps your thumb separated from the rest of your wrist so that it can’t get jammed when you’re throwing punches. Available with either Velcro or lace up wrist enclosures, these are great for people who train solo as well as with a partner. The lace ups will ultimately keep your hand more snug, but are nearly impossible to put on without the help of another person. The Velcro wrist enclosures can be easily attached without the help of others but may sacrifice something in the way of snugness. Online reviewers love them for how much protection they provide to their hands, noting their excellent knuckle protection in particular. Reviewers also give them credit for how comfortable they are, stating that they do a great job of absorbing sweat while also reducing odor over time. Some online reviewers complained about their wrist support, with one reviewer saying that his wrist would hyper-extend after long periods of training with them. Other reviewers complained about their smell when they first arrived. They’re made of synthetic leather which tends to let off a bit of a poor odor. This, however, tends to go away with time. 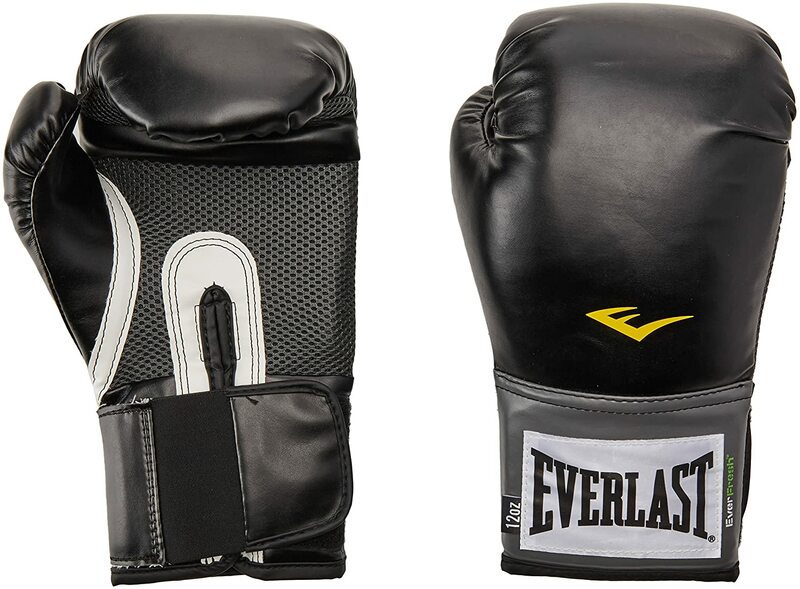 Overall, the Everlast Pro Style Training Gloves are a fine pair of boxing gloves for a very fair price. Their combination of excellent padding and supreme comfort make them a steal at their listed price. If you’re just getting into boxing and taking some time to test the waters, the Everlast Pro Styles would be a great purchase. Boxing gloves come in a variety of different types. Each type is used for different purposes, offering different characteristics and different benefits. One type is used for hitting heavy bags. These types are very padded and provide you with excellent knuckle protection, wrist support, and cushion as well as the proper weight for training. Primarily made for hitting heavy bags, they serve to protect the hand so that you can train for as long as you would like to. Another type are sparring gloves. These are typically at least 16 ounces large, and are meant to support your hands while doing the least amount of damage on a sparring partner as possible. They carry many of the same properties as fighting gloves, but are bigger and more padded for maximum protection. To help strengthen your shoulders during training, they typically possess a very heavy weight that will force you to work harder subconsciously. Training gloves are another type. These attempt to possess any property that you would ever need in a boxing glove, making them acceptable for all purposes, whether you’re looking to hit the heavy bag, spar, or fight competitively. Of course, they don’t do any one thing better than a specialized glove can do in its designated area. Training gloves are ideal for boxers who are just starting out and don’t know exactly what they want to do in the arena of boxing. The last type are fighting gloves. These are used only in the ring for competitive purposes, and serve no other purpose outside of that. They are smaller, lighter, less padded, and better equipped to hurt your opponent than any other glove. It’s not wise to train with these types because your hands will undoubtedly suffer from injury over time. Very serious boxers will own almost all of these types. But, before you purchase them, you should think about what exactly you’ll be using them for. First, it’s important to note that the size of boxing gloves is represented by ounces. They typically come in five sizes, including 8 ounces, 10 ounces, 12 ounces, 14 ounces, and 16 ounces. On some occasions, 18 ounce gloves are also used. It’s also important to note that just because one is 10 ounces in size, it doesn’t necessarily mean that it’s 10 ounces in weight. 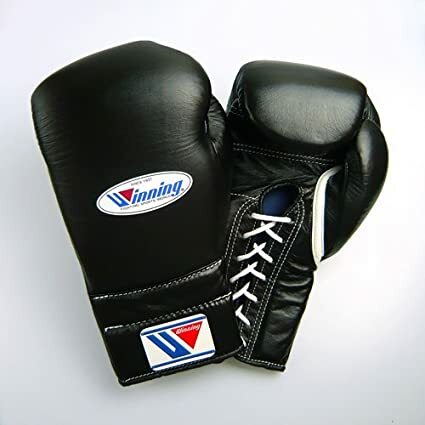 Typically, lightweight gloves are used for competitive fighting while larger ones are used in the gym for purposes such as sparring, hitting the heavy bag, and training in general. This is because smaller ones are less padded, and will inflict more damage on your opponent while large ones are more padded and will offer more protection to you hands over long training sessions. Professional fighters usually wear 8 and 10 ounce sizes during competitive matches while they wear 16 ounce sizes for sparring. When you’re trying on gloves, it’s important to first wrap your hands. This is the only way to know whether or not your hands will fit in them adequately. The color of boxing gloves is important, and not just for aesthetic purposes. There are some colors that the human eye can not perceive as well as others. One of these colors is red. This is why many competitive fighters wear red gloves while in the ring. Because it’s more difficult for their opponents to see a red coming at them, they have a better chance at landing clean, hard punches when wearing red gloves. Just as red is more difficult for the human eye to perceive, light colors are easier for the human eye to perceive. This is why light colored gloves are often used when training with other people. For instance, when hitting mitts, it’s important that the person wearing the mitts is able to pick up punches when they’re coming in. In essence, wearing light colors will help to reduce the risk of unnecessary injury. Other colored gloves can be used for solo training purposes such as hitting the heavy bag. Technically, any color can be used for any purpose. These guidelines are just here to help you train and fight as efficiently and as safely as possible. In general, boxing gloves are made from two different materials. These materials are leather and vinyl. And, to put it simply, leather is a lot more durable than vinyl. If given the choice between the two materials, you should always go with leather. It can withstand a lot more wear and tear, and will ultimately last longer. The truth of the matter is that if you purchase vinyl gloves, you’re going to have to replace them soon anyways. The only gloves made of vinyl that are alright to purchase are the ones made for cardio purposes. These require little physical contact with any other surface, and so won’t receive much wear and tear. The other aspect of a glove’s construction is whether it makes use of Velcro or lace. Lace ups are much more secure and snug, but are virtually impossible to put on by yourself. Velcro is typically not as snug, but is a lot easier to put on. If you plan on training solo, you might want to go with Velcro. If you plan on training with others, lace ups are ideal. Purchasing a pair of boxing gloves opens up a lot of avenues for you in terms of physical activity. Whether you’re looking to fight competitively, to spar, or to just hit the heavy bag, boxing gloves are needed to provide you with both comfort and protection. When purchasing a pair, it’s important to consider what exactly you’ll be using them for. Different types, sizes, and materials are appropriate for different activities, and will directly affect how successful you are in those activities. After you’ve considered what activities you’re going to be involved in, you can purchase a great pair that will suit your purposes perfectly.